Never say never. I said that I didn't think I would ever make "uncooked" whole fish but here it is by request. Inspiration came from one of my favorite food blogs, Cannelle et Vanille. Thai basil and cherry tomatoes are from my garden. The baguette boards and knife were fun to make :) Hopefully my next knife will have a metal blade and all my fingers will be bandage-free after I'm done! Coconut cake is my mom's favorite dessert. I "baked" it for her since the tatami room I had planned to give her for Mother's Day is no where near completion. The beautiful red and gold truestone pedestal platter was turned by Thomas Saunders. Silver cake server by Don Henry. I was playing with resin and made the gold plate. WHERE'S THE STRAWBERRY SHORTCAKE?!??!?! i actually am fearful of coconut, especially freshly grated ones....i don't mind so much the 'juice' or coconut milk based foods...just the coconut flake tastes...ugh, but they're so pretty huh!! yours look...almost tempting enough for me to taste...:P so cute the fish board :D or maybe cute isn't the right word, but it is adorable! In a way, I am glad there's a wee it of dust in this blog so it was easy to catch up despite being gone for a few weeks ! tee hee :0. Is that your 1st time at life fish? Damn! You are too good! 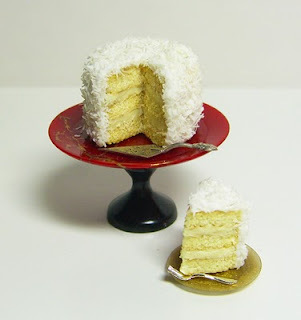 And your coconut cake is freaking amazing! I LOVE COCONUT!!!! And right after this, I am going to look for my Bounty!!! Coconut chocolate bar..yums! I blame you, dear woman for my thickening waistline!